If contractors tell you that they can do renovation work without cre­ating dust, dirt, and mess, either they don’t know what they’re talk­ing about or they simply aren’t being forthright. The mess goes with the job. However, the mess can be minimized. Good contractors will iso­late the work area from the rest of the home. If it’s a room addition, sometimes just closing and sealing off a door can be enough. If it’s a kitchen or bath, then hanging sheets of plastic floor to ceiling and taping them together can form a fairly effective barrier. However, you should be aware that no barrier will keep out the noise of con­struction. (Saws, drills, and even hammering can be deafening up close.) And even the best of the plastic barriers may not keep out all the dust and mess. Can I Live There during the Work? If you’re the sort who constantly cleans up whenever anyone spills anything on the carpet, or who can’t stand to see things out of place or a layer of dust on furniture, I’d suggest you move out during the renovation period. It would probably be a whole lot easier on your constitution and frame of mind. That way, when you move back, you’ll have only one cleaning job to do. On the other hand, if you can stand to live in a messy house, with the noise of construction going on at least during daytime hours, then give it a try. It’s certainly cheaper than moving out. And you can be on hand to help make decisions when they crop up during the work. Be especially careful of children and pets during a demolition and renovation project. Both are extreme­ly curious. And they can easily be unseen and unheard during work, so be on guard against accidental injury. 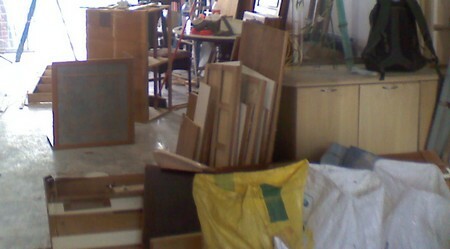 By the way, count on having to do a major cleanup of your house after the work. No matter what the contractors and work people say about the efficacy of their own cleanup, a safe bet is that you will want to do your own cleaning afterward. 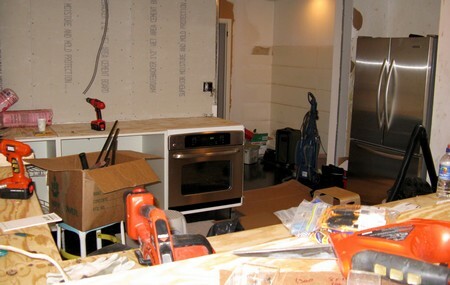 Can I Create a Temporary Kitchen and Bath? If you decide to stay during the renovation, be aware that you must have a temporary kitchen and bath in the house in order to live there. The building code as well as common sense requires it. Many cities and counties require a working bathroom at all job sites. If you don’t have one, you’ll probably have to rent one of the “port-a-potties” you frequently see outside job sites. Be aware that these can be fairly costly. Any contractor can tell you how to get one deliv­ered to your site. Check in the Yellow Pages for portable toilets. If your house has two bathrooms and you’re working on one, the other should suffice for your family during the short renovation period. Just be sure that nothing gets down the toilet in the work bathroom to plug up the drains. If you’re doing a room addition, you can typically seal off the work area without any hassle. If, however, you’re working on a kitchen, or if the work involves windows or outside walls, it can be more of a problem. With a kitchen, you’ll have to either move out or come up with a kitchen alternative. Kitchen alternatives can be creative. Some people set up a microwave and a hotplate in the garage. This can work if you have a sink in the garage and move your refrigerator in there. Others try to use one of the home’s working bathrooms as a temporary kitchen. Don’t forget that you’ll need a refrigerator and sink, a microwave or hotplate, and enough space to store dishes, pots and pans, and silverware in a temporary kitchen. There are, however, problems with both plans. You need a sani­tary surface (countertop) for a kitchen, and garages usually do not have these. So you’ll have to come up with something creative. With bathrooms, the problem is that you have be careful to shut down the bathroom before setting it up as a kitchen. Mixing waste with food preparation can be a prescription for a health disaster. Disabling the toilet and shower/bath in the bathroom during its use as a kitchen is essential. Many building departments frown on using any other area for kitchen purposes, most certainly not a bath-room. Be sure you check this out when you obtain your permits.